More than 100 Democratic members of Congress sent a letter to House Speaker Paul Ryan and Minority Leader Nancy Pelosi Thursday to oppose the cuts to federal employee retirement programs as outlined in President Trump’s fiscal 2018 budget proposal. While the Trump budget would give civilian federal employees a 1.9 percent pay hike in 2018 and military personnel a 2.1 percent raise next year, it proposes a 1 percent increase in employees’ contributions to the Federal Employees Retirement System each year for the next six years. It also would reduce by O.5 percent cost of living adjustments for Civil Service Retirement System beneficiaries, and eliminate COLAs altogether for FERS employees and retirees. Other proposals in the budget would change the calculation for pension payments to be based on federal employees’ highest five years of salary instead of the current highest three, and eliminate the supplement for employees who retire before Social Security kicks in at age 62. The Democratic coalition particularly called out the decision to target both current and future employees and retirees’ benefits as unfair. The letter to House leadership is just the latest backlash against the Trump administration’s proposals on federal workers’ retirement benefits. 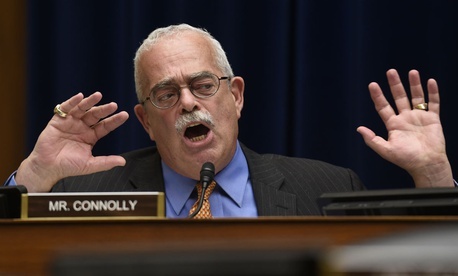 Federal unions and management groups roundly criticized the measures upon the budget request’s release, and some Democrats—including Connolly—have already spoken out in opposition. Officials with the American Federation of Government Employees announced Wednesday that they recently sent letters to every member of Congress urging lawmakers to fight the retirement cuts. National Treasury Employees Union President Tony Reardon applauded the effort by congressional Democrats.